In a new book by power house authors, Hall of Famer Lisa Leslie and award winning CEO Bridgette Chambers, readers quickly learn how to reignite the powerful foundation of strength formed while playing competitive sports and parlay those life changing, high performing behaviors into success in the business world. Through stories and winning strategies, Lisa and Bridgette invite readers to RE-IGNITE their passion and competitive spirit. Next, the authors introduce a path designed to help readers RISE to the challenges ahead and find the inner-strength and constitution to keep REACHING for greatness in business. Success in athletics is a lot more than gaining strength, speed, agility, and the particular skills of basketball, football, soccer or any other sport. Becoming a successful athlete means developing strong mental skills, too. These mental skills will help you every step of the way, for the rest of your life, in just about any profession you pursue. Lisa Leslie and Bridgette Chambers are great examples of having all the athletic abilities and the mental skills too! Having known Lisa since she was a star high school athlete to becoming the one of the great women’s basketball players dominating the court and leading her teams to California state basketball titles, NCAA crowns, WNBA championships and Olympic gold medals, she is a long way from being finished. She took the focus, teamwork and drive for excellence that she learned as an athlete to become a successful role model, sports analyst, businesswoman, and motivational speaker. On top of all that, she has managed to be an amazing mom, a great wife, and a loving daughter. Bridgette Chambers was also a great athlete first as a swimmer and water polo player and later became a talented soccer player in school and in the U.S. Army. She used her mental discipline in the business world to become a well-known corporate turnaround expert and successful CEO of several huge corporations. Lisa and Bridgette are both impressive women but they are also really kind, caring people, who want to share what they’ve learned and help others to achieve. From the Court to the Boardroom describes what it was like for both of them as young girls just realizing that they enjoyed competing in sports to success after their playing days. It explains how they applied those lessons to their business careers. The most important lesson in the book is that you don’t have to be a national champion or an Olympian for these lessons to apply. They share important skills on leadership, determination, teamwork, and striving for excellence. I’m confident the lessons in this book will work for you, too. Sign up for our email list to get the latest news from Lisa and Bridgette! This dynamo duo has traveled the globe speaking to audiences about leadership, diversity, and personal success. They have co-launched the EmpoweredW Community designed to provide knowledge and support to young entrepreneurs endeavoring to change the world one business model at a time. At every possible level of play, Lisa Leslie was the most dominant player in women’s basketball. She led Morningside High School to two California state championships; at the University of Southern California, she was the Pac-10’s all-time leader in points, rebounds, and block shots; she played on the United States’ Olympic gold-medal-winning teams in 1996, 2000, 2004, and 2008; and, as a multiple MVP, she led the Los Angeles Sparks to back-to-back WNBA championships. As a tribute to her leadership and paradigm shifting talent, Lisa was inducted into the Naismith Memorial Hall of Fame and the Women’s Basketball Hall of Fame in 2015. But Lisa is so much more than an athlete: modeled for the Wilhelmina Agency, author of the memoir Don’t Let the Lipstick Fool You, television sports analyst, motivational speaker, entrepreneur, founder of several non-profit organizations, and former co-owner of the L.A. Sparks. As if this weren’t enough, she and her husband, Michael Lockwood, are parents of Lauren and MJ. 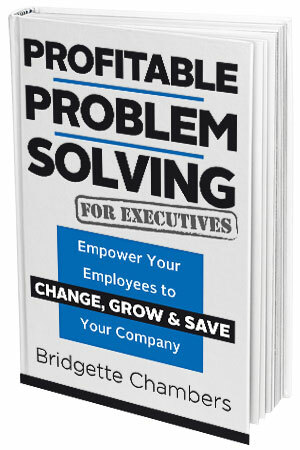 Bridgette Chambers, industry leading growth strategist, brings over twenty years of success helping entrepreneurs and business owners envision and implement intensive growth strategies. 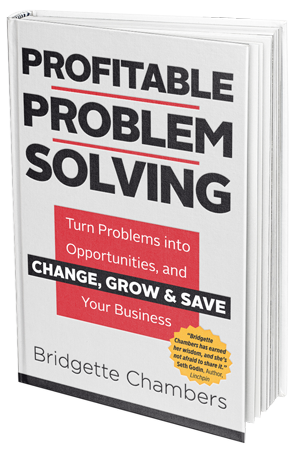 Chambers is the author of Profitable Problem Solving™, the highly acclaimed book that provides actionable strategies for profitable problem solving and empowerment for entrepreneurs and intrepreneurs. Chambers is a celebrated keynote speaker that has shared the stage with Colin Powell, Lisa Leslie, Seth Godin, Michael Eisner, and other notable personal brands. Chambers founded BGBC Marketing in 2013 to put the knowledge and tools necessary to grow a business in the hands of small business owners across the globe. As CEO, Chambers has been at the helm of many successful companies, including Constellation Research, a world-class research technology firm helping clients to unleash the power of emerging and disruptive technologies based in Silicon Valley. Also CEO of Americas’ SAP Users Group (ASUG), the largest trade association serving SAP customers on the globe. During her tenure with ASUG, Chambers led a transformation that took the twenty-year brand from a period of financial and operational trouble to one of prosperity and stability. While serving as CEO for ASUG, Chambers doubled membership, enhanced service and delivery, rebuilt the corporate culture, and created substantial growth in earnings. ASUG was awarded two American Business Awards under Chambers tenure including Company of the Year. Chambers was awarded several ABA awards as well, including Maverick of the Year. Chambers received her Bachelor of Science degree from the University of Houston, her MBA from Texas A&M University, and developed her leadership skills while serving proudly in the United States Army Reserves and the Texas Army National Guard. 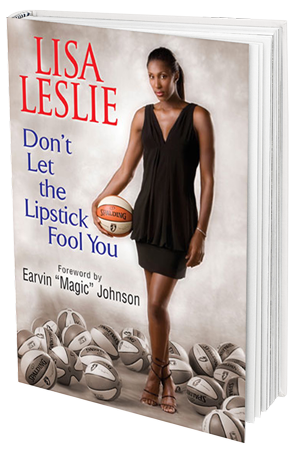 “Don’t Let the Lipstick Fool You” tells Lisa Leslie’s story, from growing up in a single-parent house to rising through the ranks as a WNBA all-star. With heart and honesty, she shares the hopes, dreams and ambitions that turned her into an Olympian, successful business woman and a loving wife and mother. Learn how to CHANGE, GROW & SAVE your company with strategies designed to ensure profit or personal gain with the Amazon Bestseller! If you’re looking for a way to differentiate yourself, grow your career, and increase your net worth… why not begin by putting your problem solving skills to work for you. Empower your employees to CHANGE, GROW & SAVE your company. Why do companies let small, simple problems fester and grow into complex, expensive, and disruptive issues? Wouldn’t it be smarter to solve those problems when they are small and encompass less risk? The great CEOs are the superstars who build a legacy filled with sustained profitability, market-changing innovations that create competitive advantage, and enduring corporate cultures that fuel continuous improvement. 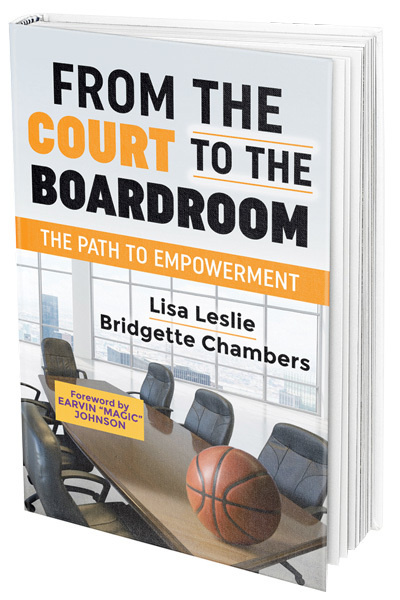 From the Court to the Boardroom - a Story of Leadership and Success, is the new book by Lisa Leslie & Bridgette Chambers. Copyright © 2005-2016 Bridgette Chambers & Lisa Leslie | All Rights Reserved.